Mangaluru, Apr 18, 2018 : SHGs, ASHA and Anganwadi workers in Kaup assembly constituency took part in the ‘Jatha’, organised human chain and also mime shows to create awareness among voters, as part of SVEEP programme. More than 400 SHGs, ASHA and Anganwadi workers took part in the Jatha and displayed the placards carrying various messages creating awareness on voting rights. They also organised human chains and spread the importance of people coming out and casting their precious right in the democratic set of government. The awareness songs given by Election Commission were also sung by the participants on the occasion. Zilla Panchayat CEO Shivanand Kapashi administered the oath at Sri Lakshmi Janardhana temple for the gatherers and said the Election Commission is emphasising on ethical voting and stressed on voting from the electorate without succumbing to any pressure. He said that if the voters encounter any sort of pressure, they can complain to the district administration without hesitation. The district administration would respond immediately. He urged not to yield to threat or pressure, but think and vote. 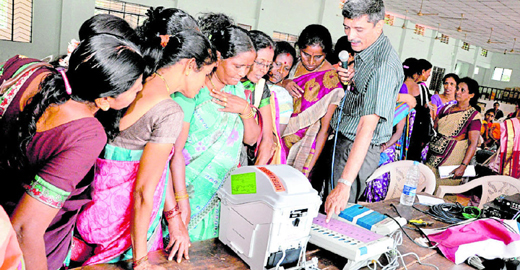 The demonstration on VVPAT was held.